Experience fun filled family entertainment, fit for the aristocracy of Northumberland, with our resident jester’s hilarious blend of medieval comedy, magic and occasional mischief! Whether wobbling precariously on wooden stilts, close shaves with his fire- eating antics or balancing upside down on any fool he can trick into lying on the floor, Peterkin will have you thoroughly amused by his unabashed tomfoolery! A jester of international repute and an unrivalled historical comedian, Peterkin is an entertainer like no other! His zany satire will have your sides splitting with uncontrollable glee. Otherwise… it will be off with his head! So why not come and meet the traditional English Fool who ‘hath not so much brains as earwax’ and experience high jinks combined with a slice of medieval mayhem. 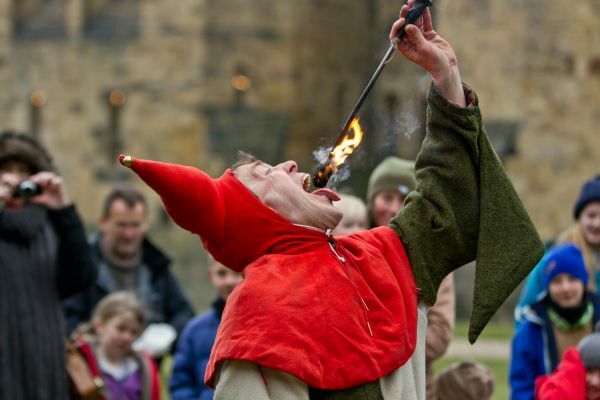 Having performed extensively across the UK and Europe including for Her Majesty the Queen, Peterkin the Jester will grace Alnwick Castle this season with his rumbustious spirit! This is one performer not to be missed! These brilliantly amusing performances are free with admission to Alnwick Castle! Please check the ‘What’s On’ board upon arrival for show timings and locations, as these can vary throughout the season.